I have taken it with the phone times. It could look like this in locus. Route can be moved to another street. So I can calculate a route quickly. Enter start and finish, calculate, make small changes. For example, I would like to take the path at the edge of the forest and not over the field. FC while click on label to open GC-listing, but only on some caches ?! understand, thanks for an explanation. What you want is already possible with middle "red circle" point in every segment. So just drag and drop it to the new location. 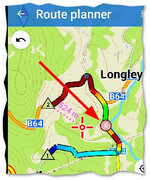 Or you may alternatively add point (detour) by long click on the place which you want to pass. thanks. Log received, issue found! For others, I can simply pull the track or route (google Maps on PC). I click the route anywhere. Then I draw the line where I want. And already a new route is calculated. You could then create a shaping point on the spot. Can you do something like that? @freischneider - is that a suggestion for me? The Route Planner already allows a tap/drag (or swipe) of a Track/ Shaping/ Via point to force the route through a new point. 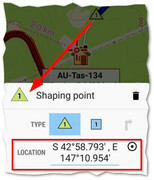 If you are zoomed out the new point may be quite inaccurate as it doesn't snap to nearby road; or desired road may not even be visible at current zoom level. For short distance a swipe of the point to a nearby position may be OK but sometimes one of these other existing methods (My Points/ Coordinate/ Search) may be more convenient. Notes to Event Manager. I apologize, I will continue to write Czech, my English is no longer enough. @Žajdlík Josef - I think your English is very impressive. In any language specific thread (not a mixture of languages) it is nice not to have to translate from one language to another if possible so please persist if can please. So about which point we talk here? Moving directly with trackpoints is not acceptable: you never may be sure, which point you are moving with and also there are other options how to add a point in the middle of the track on exact place. If I tap the cyclist icon the bottom dialog shows this point is a Track point and can be converted to a Shaping, Via, or Navigation point. No problems. I am also able to swipe (tap/ drag) this Track point to any new location on the visible map (with magnifying glass) although as I explained in the post to @freischneider this can be problematic if the zoom is low or the map distance is large. So I can't see why it is not consistent to allow this Track point to be moved to any new location using the other selection methods. I agree a new point can be added via the menu; and this will have the desired outcome too. But I explain this UX to another user thus: tap on red, green or blue icon then choose new location, but don't tap on the cyclist icon, you can only choose a new location for this point from the menu sorry. I have just installed Locus Pro 3.32.2 & beta 3.32.2.7 onto a new 7.1 tablet. I did a backup from phone to ZIP file which was copied across & then restored. For some reason it took many many restarts before correct Presets were displayed, and config.cfg setting dev_gui_main_rescale_value was used. Changing the Backup folder from default /Locus/Backups to /Downloads/Locus would each time cause a crash. I know that with the red dot. But at a long distance 40 km. Only 2 points (start, finish) If there is 1 red point. If I zoom in to change details on the track, I may not even see it. So it would be more comfortable if I could just pull the route.lang drücken auf Route. This can then possibly change to a via point. In all my latest recorded tracks, I have extreme ascend/descend values, >400% at times. Elevation values are by srtm here, they replace gps values. I did not change it. This makes the graph unusable. Anyone else? @tapio - yes I had same experience one month ago - see ongoing discussion here. ah, here comes confusion. The red circle isn't clickable! It allows to drag & drop to create a new shaping point, but click do nothing! What happens to you is that click on this point, selected nearest trackpoint on track, so you had feel like you click on track. I've anyway improved this now, and this red circle now offer information about this track segment with an option to recalculate it. Problem with backup: hmm crash needs logs. Anyway problem with restoring, hard to say. App should check if config.cfg was changed and use it or overwrite based on this. understand your point with dragging of trackpoints, but I still do nothe t like it. 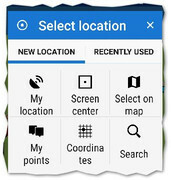 On smaller screen, you often drag map with fingers and with this feature, you will have to worry even more to not to drag part of existing route. Use long click > it's even faster (mainly with new Beta version). export me please your track to GPX, I'll check why this happen, thanks. thanks, should be fixed now. New Beta? Most probably today. EDIT: Beta version is out! - next click top left in "bottom window" triangle, square or circle > point detail window opens, why? i can´t switch off "Allow login over Play Service"